I'm about to do a bit of highway travel this week, will be keeping my eyes open for more sightings. I love the stance of the Micra in this pic -- the forward-leaning look to the backs of the wheel arches. Saw a black S or SR heading east on the 401 just west of Cornwall this afternoon. 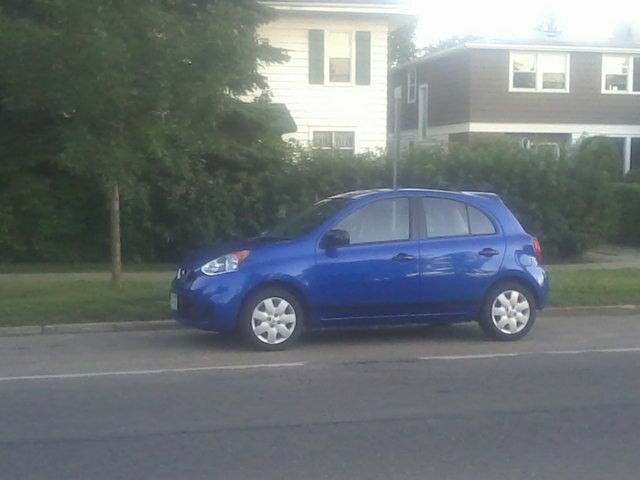 It was Quebec-plated with the Euro-style MICRA front plate. I was headed the other direction coming back from a sailing regatta in Vermont, dead tired in the back seat, and didn't have the time to snap a pic.. or the reflexes! I also saw another Micra today - a red S I think it was. At Bayfront Park area in Hamilton. Was visiting family there and walking along the paths when I saw it. Cool. I also saw 3 or 4 in Cornwall Nissan... but that doesn't really count. White SR with tint... what are the odds? I haven't seen any others since the one on the highway last week. I see Versa Notes on a pretty regular basis though - stretch Micras, I call 'em. Funny thing.. My neighbour has a silver versa. She says I just left my versa in the dryer too long. Round trip to Montreal today, saw none on the way there, or while there. Saw two on the way home though (401/20): one Caspian Sea, the other Red, both S or SV. and a Tesla Model S electric sedan.